Bonds have been booming and attracting inflows as a result. 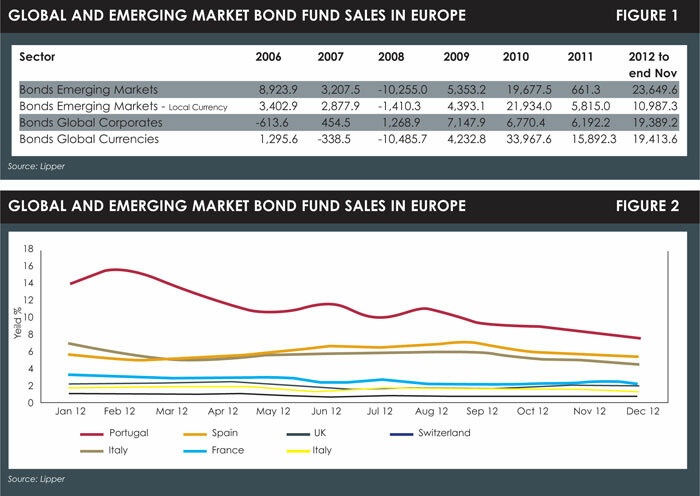 Data from Lipper show that global bond flows to November 2012 totalled €38.8 billion, while €34.6 billion flowed into emerging markets bonds (see Figure 1). However, 2013 looks set to be a different kettle of fish. The talk is of a move out of bonds and into equities. Michael Hartnett, chief investment strategist at Merrill Lynch, recently predicted a “great rotation”. Bond managers dispute whether there is substance behind the rotation talk. Many investors expect strong performance from high yield bonds in 2013. Institutional investors named high yield as one of the three most attractive asset classes for 2013 in a survey conducted by Camradata, an institutional investment analysis firm. This view held good across asset managers, pension funds and insurance companies. And, interestingly, while institutions told Camradata they had identified equities as the biggest opportunity for high returns, none was planning to invest in them. “We can only guess that the spectre of volatility continues to stalk this asset class,” says Steve Butler, Camradata managing director. No one, however, is predicting that core sovereign bonds will perform well in 2013. Government bond yields in the industrialised countries are at an all-time low (Figure 2), and most fixed-income fund managers expect them to stay that way. Ad van Tiggelen, senior investment specialist at ING Investment Management (ING IM), believes core sovereign yields will stay around, or slightly above, the current low levels for an extended period. According to ING IM, the current amount of total debt (sovereign, corporate, consumer and financial) in the developed world is about 350% of GDP, compared with 250% in the late 1990s and 150% in the early 1980s. Any substantial rise in core sovereign yields would, therefore, be self-defeating, says van Tiggelen. Why do core sovereigns continue to sell at all? After all, as Nick Gartside, international chief investment officer for fixed income at JP Morgan Asset Management (JPMAM), points out, the likes of Gilts and US Treasuries are offering lower than inflation returns. The question is especially valid since core sovereigns’ description as safe is, as Kommer van Trigt, bond fund manager at Robeco, puts it, increasingly found in parentheses. One reason, says Jim Cielinksi, head of fixed income at Threadneedle, is that while “core government bonds are rubbish value, that doesn’t mean you’ll lose a lot of money by investing in them”. With investors seemingly unwilling to take on equity risk – the Camradata survey shows that institutional investors identify equities as the biggest opportunity for high returns but, paradoxically, are not planning to invest in them – this is, if not a compelling argument to invest, at least an argument. “There’s a shortage of high-quality instruments to protect against the downside,” says Cielinksi. Thus, negative-yielding Swiss government bonds were able to find buyers because they provided protections against the possibility of the euro collapsing. Japanese investors have continued to buy Japanese government bonds despite yields verging on the microscopic because, says van Tiggelen, “they are still the safest and most predictable investment”. Some investors, of course, such as central banks, pension funds and insurance companies, do not buy core sovereign bonds through choice, but because they are obliged, or quasi-obliged, to do so. Others, such as sovereign wealth funds, may find that diversification requirements lead them inexorably towards high-quality government debt. Pension funds might choose a different asset allocation if they were free to do so. One can, therefore, question whether the existing regulatory framework is meeting its ultimate goals by pushing them into core sovereign debt. On the other hand, pension funds will always have to match their liabilities, and the purest asset they can use is government bonds. And, as Guy Williams, chief investment office at Fischer Francis Tree & Watts, notes: so far, “whenever something has gone wrong, government bonds have still been able to rally”. He expects continued interest in safe fixed income assets, even from retail investors, though he concedes that the argument for retail investors to hold government bonds at current levels is not as powerful. But, he says, “until we see negative returns from fixed income, I would not expect mutual fund inflows to reverse”. Investors of all types have nonetheless been recalibrating their portfolios in order to navigate through this period of exceptionally low core sovereign yields. And, typically, they have moved into higher-yielding debt, such as corporate and emerging markets bonds. In fact, emerging market debt seems to be on almost everyone’s list of favourites (see box, overleaf). But perhaps one of the biggest challenges in bond investing at the moment, whether in emerging or developed markets, are the great differences between countries. But even if you know everything about a country’s economy, it is not always fundamentals that drive markets. This geographic complexity reflects a generally more complex and difficult fixed-income environment. Perhaps the best advice that investors can hear is not to expect too much.